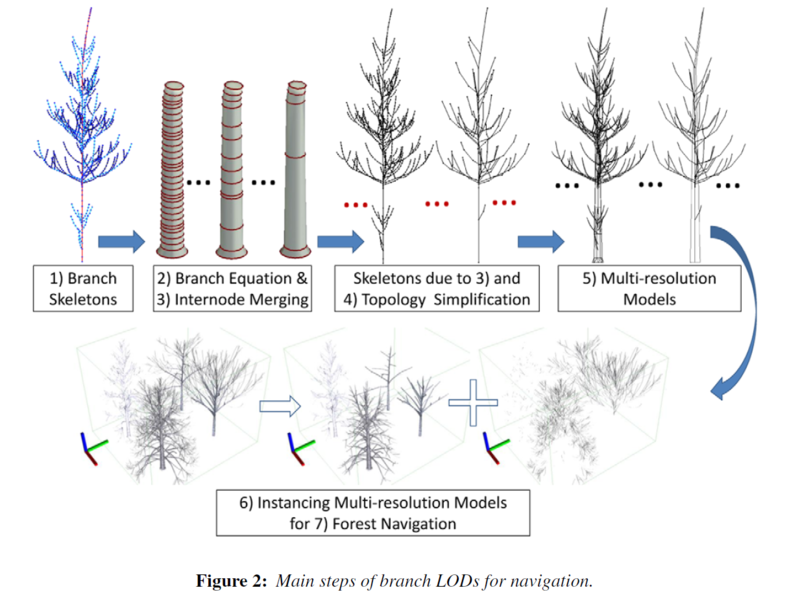 We present a level of detail (LOD) method designed for tree branches. It can be combined with methods for processing tree foliageto facilitate navigation through large virtual forests. Starting from a skeletal representation of a tree, we ﬁt polygon meshes ofvarious densities to the skeleton while the mesh density is adjusted according to the required visual ﬁdelity. For distant models,these branch meshes are gradually replaced with semi-transparent lines until the tree recedes to a few lines. Construction ofthese complete LOD models is guided by error metrics to ensure smooth transitions between adjacent LOD models. We thenpresent an instancing technique for discrete LOD branch models, consisting of polygon meshes plus semi-transparent lines.Line models with different transparencies are instanced on the GPU by merging multiple tree samples into a single model. Ourtechnique reduces the number of draw calls in GPU and increases rendering performance. Our experiments demonstrate thatlarge-scale forest scenes can be rendered with excellent detail and shadows in real time.